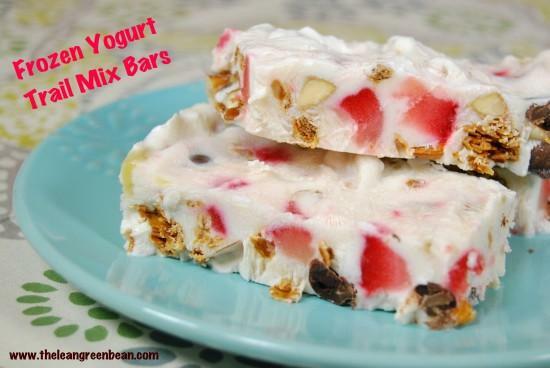 This recipe for Frozen Yogurt Trail Mix Bars is easy to customize and makes a perfect healthy snack or breakfast for both kids and adults! Happy New Year!! Last year on January 1st, I posted a recipe featuring Greek yogurt: Whole Wheat Oatmeal Pancakes. They’re my favorite pancakes ever and I make them all the time. This year, I decided to continue my tradition and share another yummy recipe that features my favorite yogurt on New Years Day! 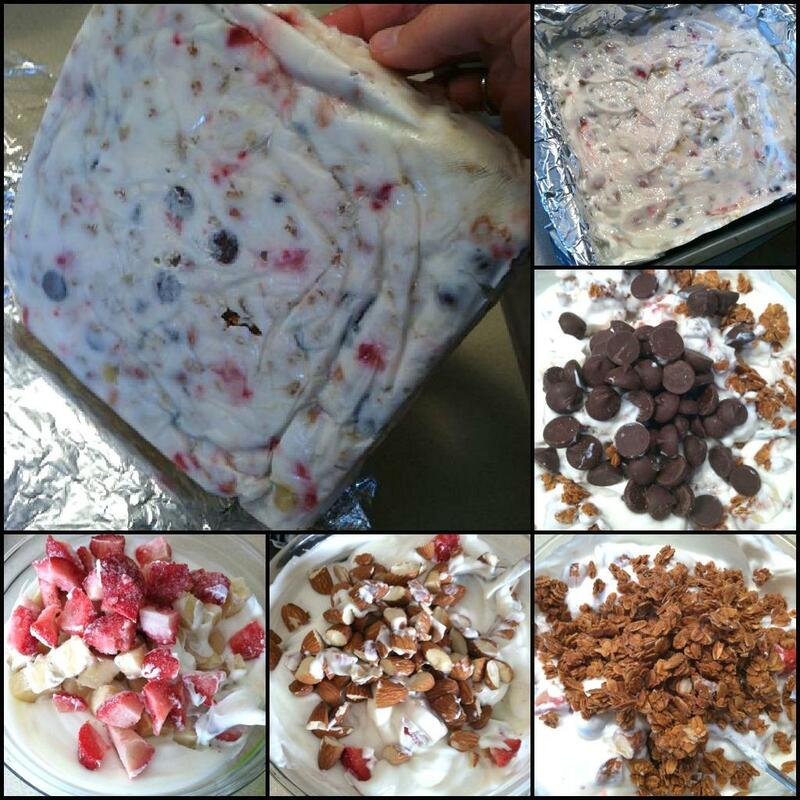 I give you… Frozen Yogurt Trail Mix Bars! Aren’t they pretty?! Probably the prettiest thing I’ve made in a while. 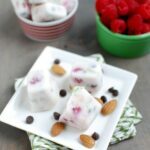 Remember when I made these Frozen Yogurt Bites? I dipped them in chocolate the first time but now I made them all the time with just yogurt and granola, and eat them as a snack. Well, these bars are similar… I just took them to the next level. 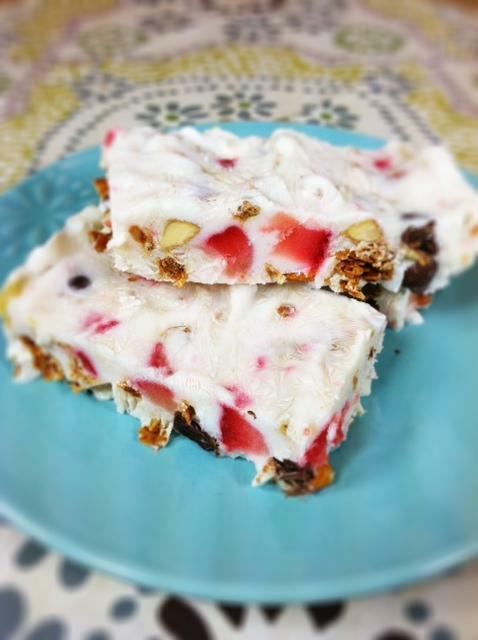 I was tired of eating regular granola bars, so I took all the things I like in my trail mix/granola bars – granola, fruit, nuts, a few chocolate chips – and decided to try a frozen version. I used bananas and strawberries that I already had in the freezer in mine. I just pulled them out, chopped them up and mixed them in the yogurt, but I think fresh fruit would work just fine. I also chose to use half plain yogurt and half flavored. If you want them sweeter, you could use all flavored. 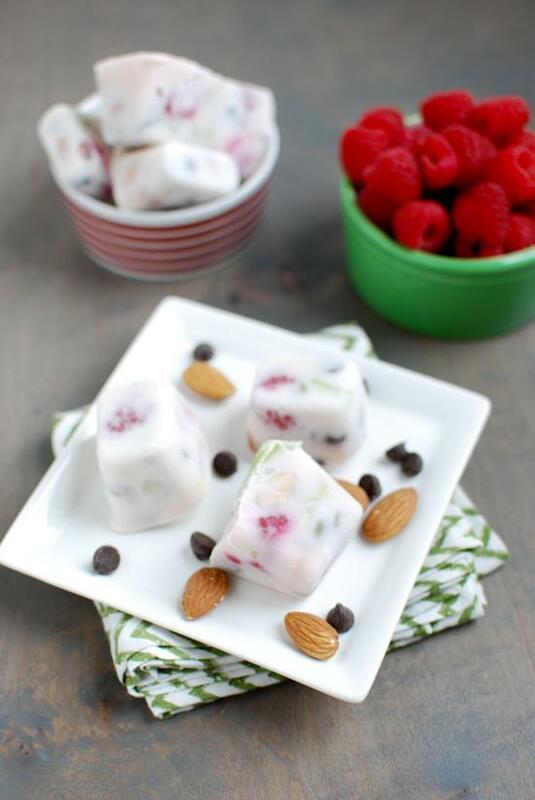 Mix and match your favorite mix-ins for these delicious frozen treats. The possibilities are endless! Line a pan with foil. Spread yogurt mixture into pan. Remove from freezer, let thaw for 5 minutes, cut into bars. Just mix, spread and freeze. Get creative with your mix-ins – the possibilities are endless! When I eat these, I pull one bar out, let it sit on my plate for about 5 minutes, and then dig in! Spoon into ice cube trays, freeze, then pop out with a knife and store in a a tupperware container in the freezer. Do these look good to you?! Please share them with your friends and family via Pinterest, Twitter and Facebook! I have been waiting for these. YUM. Can’t wait to make them. What a great idea! They look really good and it’s so nice to have bars that you know are made with simple ingredients. I have been anxiously awaiting this recipe since you posted it on Instagram. Yay! They look just as wonderful as I anticipated they would be. These look awesome!!! Thanks for sharing! Oh you KNOW I love these!! I made your last variety over the summer, but I think I’ll be making this variety soon. I love the addition of the nuts. Brilliant. Mmm! These look awesome! I love your frozen yogurt bites so I’m sure I’d love these! You did it again. You have me drooling all over my keyboard! My whole family would love these treats. Have a Happy New Year! These look amazing! I’m definitely going to try them. What a great idea! And yes, so pretty. I’m definitely experimenting with these and will try different mix-ins. Happy New Year! Ohhhh… I was excited to see this recipe after you posted the IG pic. Making these today! In about 5 mins actually… perfect start to my Junk Free January! OMG when I saw the picture of those bars… My eyes popped out of my head! You made those, holy moly they look sinfully DELICIOUS except they’re sinless!!! You should package them up and sell them, seriously!!! Watch out Quaker Oatmeal and Kelloggs!!!!! Lean Green Bean Trail Mix Bars are going to DOMINATE! LOVE LOVE LOVE! I have all the ingredients and I think I will use pomegranate in mine. 🙂 Still also need to make one of your lentil recipes. Now that the holidays are gone, I can tackle that too. I think this is the first time ever commenting 🙂 I love your blog and have been reading it for about 6 months and sometimes your recipes are intimidating but this one – I will most definitely be making this one, easy delicious and healthy 🙂 Thanks!! They look delish thanks for sharing! You’re so creative! I love this, there are so many different things you could mix in. I am SO MAKING These this evening!!!!! This is genius! This would be such a great breakfast/ post workout snack especially in the summer. Add a few chia seeds and you can get your omega-3 fix too! that sounds awesome! love the idea of adding Pb! YUM. I love these- just made some today!!! I loved this recipe, it was so easy and great that you can add whatever you like. Just found your blog and I’m delighted. Wow, I can’t wait to make these bars. They look so good. And now I’m off to look at all your other recipes! awesome! glad you found me! let me know how they turn out! Wow. These look incredible. I’m always looking for new ways to mix up my snacking. I too have quite a thing for Chobani. I can’t wait to try these! my hubby and i like them for snacks and for dessert! these are a great idea and sound yummy! Made these this afternoon but was too full from lunch to try one… they look amazing, though, and I’m definitely having one for breakfast in the morning!! awesome!! let me know how they are! Looks delish! How do you store the bars after? In the freezer or fridge? i store them in an airtight container in the freezer. then pull them out and let them sit at room temp for about 5 min before you eat them! Does this work with coconut milk yogurt? i’m not sure, i’ve never tried it…but I would assume so! these are great and they are pretty too! Many thanks for these yogurt bars! I made them four times in the last 10 days. My kids love them. I use mostly organic ingredients and they taste awesome. I place them in a square silicon baking pan and that makes for a quick removal once frozen. I am looking forward to making more of your recipes. I always wonder what does a dietitian eat, because you have so much knowledge about food. I absolutely love this recipe! It was SO easy to make! I don’t think it even took 5 minutes! Fabulous time saver. Best part: it’ll be ready to go tomorrow morning! Thanks for the great post! Can’t wait to eat them! Making these now! I used blueberry and banana and used a granola with flax seed. Also added a tsp of agave nectar for extra sweetness (I have a sweet tooth). Can’t wait to cut em up and try! This is an amazing recipe. Will bookmark, try to make and like to share on G+. Keep Sharing. Thank you for sharing. I made these and they’re delicious but storing them in the freezer isn’t working so good because they freeze so hard. If I move a small batch at a time into the fridge will they just liquify? yes, they will just turn back to yogurt. i leave mine in the freezer and take them out 5-10 min before i want to eat them. It gives them time to thaw and i’m able to eat them with no trouble. This looks delicious so I made it tonight! Just wondering how long it took yours to initially freeze? so with the yogurt i guess they aren’t dairy free? or is greek yogurt dairy free? are these dairy free? if so i guess greek yogurt is dairy free? great idea! i love freezing them in ice cube trays and just eating a couple at a time! What size pan do you use? And how many bars does it make? You can use any size pan. I think i used a 9×9 and cut into whatever size bars or squares you want! I’m so glad I found your blog through PBF today 🙂 I printed off several of your recipes! aww, glad you found me as well! happy eating! I would hope, as a registered dietitian, you would put the nutritional information on your recipes. Thanks for sharing your opinion! I choose not to post the nutritional information for several reasons, but anyone can easily plug the recipe into My Fitness Pal to obtain the nutrition information if they’d like! i don’t have an estimate but you could plug the recipe into myfitnesspal to find out! [WORDPRESS HASHCASH] The comment’s server IP (72.232.113.87) doesn’t match the comment’s URL host IP (76.74.254.120) and so is spam. [WORDPRESS HASHCASH] The comment’s server IP (72.232.112.17) doesn’t match the comment’s URL host IP (76.74.254.123) and so is spam. [WORDPRESS HASHCASH] The comment’s server IP (184.168.152.183) doesn’t match the comment’s URL host IP (184.168.56.1) and so is spam. [WORDPRESS HASHCASH] The comment’s server IP (66.155.8.97) doesn’t match the comment’s URL host IP (76.74.254.120) and so is spam. [WORDPRESS HASHCASH] The comment’s server IP (66.155.8.98) doesn’t match the comment’s URL host IP (66.155.9.238) and so is spam. [WORDPRESS HASHCASH] The comment’s server IP (76.74.254.59) doesn’t match the comment’s URL host IP (66.155.9.238) and so is spam. [WORDPRESS HASHCASH] The comment’s server IP (72.232.7.101) doesn’t match the comment’s URL host IP (72.233.69.6) and so is spam. [WORDPRESS HASHCASH] The comment’s server IP (72.232.113.11) doesn’t match the comment’s URL host IP (72.233.69.6) and so is spam. [WORDPRESS HASHCASH] The comment’s server IP (66.155.8.106) doesn’t match the comment’s URL host IP (66.155.9.238) and so is spam. [WORDPRESS HASHCASH] The comment’s server IP (72.233.69.85) doesn’t match the comment’s URL host IP (72.233.69.6) and so is spam. [WORDPRESS HASHCASH] The comment’s server IP (208.113.235.54) doesn’t match the comment’s URL host IP (208.113.151.67) and so is spam. [WORDPRESS HASHCASH] The comment’s server IP (50.57.128.66) doesn’t match the comment’s URL host IP (141.101.117.250) and so is spam. [WORDPRESS HASHCASH] The comment’s server IP (184.168.152.207) doesn’t match the comment’s URL host IP (184.168.60.1) and so is spam. [WORDPRESS HASHCASH] The comment’s server IP (50.116.62.92) doesn’t match the comment’s URL host IP (141.101.112.27) and so is spam. [WORDPRESS HASHCASH] The comment’s server IP (50.97.101.210) doesn’t match the comment’s URL host IP (50.116.85.18) and so is spam. [WORDPRESS HASHCASH] The comment’s server IP (72.232.7.95) doesn’t match the comment’s URL host IP (76.74.254.120) and so is spam. [WORDPRESS HASHCASH] The comment’s server IP (66.155.8.78) doesn’t match the comment’s URL host IP (66.155.9.238) and so is spam. [WORDPRESS HASHCASH] The comment’s server IP (66.155.9.34) doesn’t match the comment’s URL host IP (72.233.2.58) and so is spam. [WORDPRESS HASHCASH] The comment’s actual post text did not contain your blog url (https://www.theleangreenbean.com/frozen-yogurt-trail-mix-bars) and so is spam. [WORDPRESS HASHCASH] The comment’s server IP (72.233.104.119) doesn’t match the comment’s URL host IP (76.74.254.123) and so is spam. [WORDPRESS HASHCASH] The comment’s server IP (72.9.37.99) doesn’t match the comment’s URL host IP (108.162.198.151) and so is spam. [WORDPRESS HASHCASH] The comment’s server IP (213.163.66.101) doesn’t match the comment’s URL host IP (213.163.66.95) and so is spam. [WORDPRESS HASHCASH] The comment’s server IP (98.158.192.24) doesn’t match the comment’s URL host IP (98.158.195.130) and so is spam. [WORDPRESS HASHCASH] The comment’s server IP (76.74.255.91) doesn’t match the comment’s URL host IP (76.74.254.123) and so is spam. [WORDPRESS HASHCASH] The comment’s server IP (173.236.168.106) doesn’t match the comment’s URL host IP (173.236.168.195) and so is spam. [WORDPRESS HASHCASH] The comment’s server IP (173.244.148.98) doesn’t match the comment’s URL host IP (104.27.131.1) and so is spam. [WORDPRESS HASHCASH] The comment’s server IP (69.195.124.114) doesn’t match the comment’s URL host IP (104.28.12.80) and so is spam.